Melissa Swallows, a third grade teacher in Downers Grove, IL, had the brilliant idea of capturing all of the reference posters on her classroom walls in Showbie, making it easier for her students to access the information they need — even from home! During learning, the students will go into Showbie on their own when they need to refer to a poster or notes. When we worked on measurement learning targets for math last year, I filled the math section with posters showing conversion information. Each day, kids opened those posters up to refer to them. This method gives students immediate access. 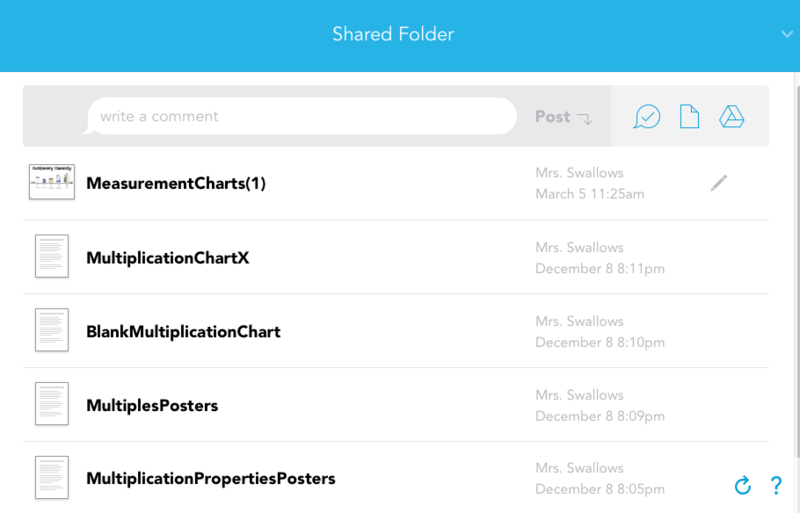 Soon all of Melissa’s core classes had references conveniently stored in Showbie as ‘assignments’, making it easy for her students to find them and use them as they completed work in class or even at home. Melissa also adds rubrics to Showbie that students can use as reference points. In addition to posters, I also include class notes or rubrics for kids to refer to. They love these references in Showbie. Any one of my students can tell you that we don’t have room in the classroom to display all of those posters! Lack of wall space aside, the ease of flipping between pages in Showbie makes it easier for students to use these tools, and the fact that they can use them at home makes them much more relevant in 1:1 classrooms.